Created 4 Creativity : Simon Says Stamp Wednesday Challenge Guest Blogger - Not Feline Well? Simon Says Stamp Wednesday Challenge Guest Blogger - Not Feline Well? I am having a ball as this month's guest designer for the Simon Says Stamp Wednesday Challenge Blog. Who doesn't love Simon Says Stamp? - I mean seriously!! This week's challenge is FURRY FRIENDS and we are showcasing Newton's Nook products. I used the Sick Day stamp set for my card. Coloring in this little cutie was a breeze! And I just had to add some sparkle with a Wink of Stella clear glitter pen and also one little Pretty Pink Posh heart sequin. I have listed below the products I used on my card. You can see my card as well as all the other design team cards on the blog today.. You won't want to miss the inspiration! Welcome, Susie, so pleased to have you as our guest designer this month! Love this adorable little cutie! such a cute card Susie :-) this is sure top cheer up anyone who's feline unwell ;-) I love the stitched circle tag too, the whole design is fabulous! 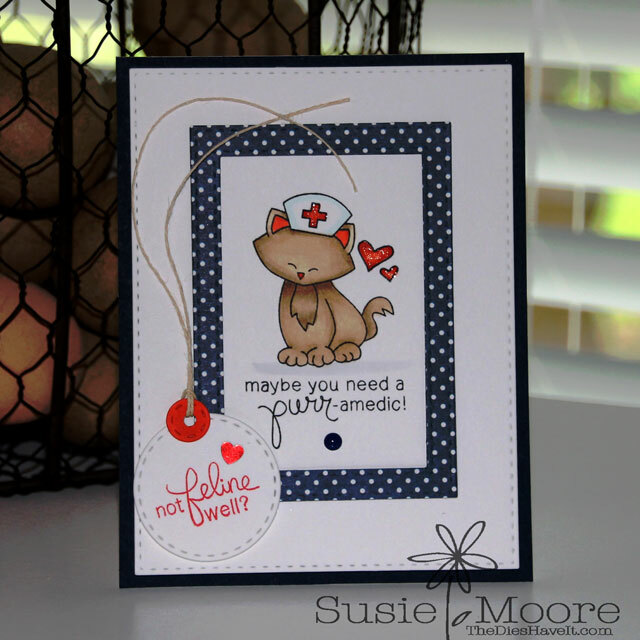 A gorgeous card Susie, a fabulous design and paper combo, your nurse Kitten is adorable and super sentiment panel!! Absolutely darling! Love how you used the SSS dies and cute kitty images, Susie! Such an adorable card, Susie! Great sentiment to go with the nurse kitty. Love your card. Love your card Susie, your kitty is such a cutie ! Adorable card Susie! Such a sweet kitty! Wonderful coloring!! This is so adorable! I love ho you colored the kitty and the added bits of sparkle! Such a great get well card!! Such a purrfect get well card! Love NND stamps! Great card Susie, love the clean layout, adorable.